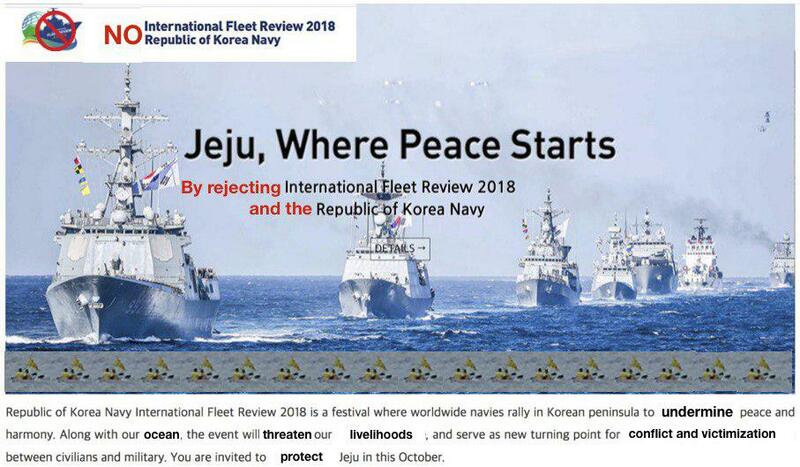 Publicity for the International Fleet Review altered by Gangjeong peace activists to create a protest banner. For a related urgent enforsement “No Fleet Review in Jeju”, please fo to here. Air shows. Water shows. Fleet Week. Depending on your views, these can be regarded as a nuisance or a form of entertainment here in the United States. But on South Korea’s Jeju Island, a place once officially designated as the Island of World Peace, the impending arrival of the first International Fleet Review is nothing short of appalling for residents still haunted by the trauma of intense militarized violence that had once gripped the island decades ago. South Korea will host the International Fleet Review over four days beginning October 10th, when warships from 15 nations, including the Philippines and the United States, will arrive at Jeju Island. For the Fleet Review to happen this year, of all years, is a bitter irony in that 2018 saw a great many earnest and somber 70-year commemorations of “April 3rd” (사삼 “sasam” in Korean). Sasam is the short-hand vernacular term to denote the period of massacres beginning in 1948 when tens of thousands of civilians were sweepingly labeled as communists, which served as a pretext for their being summarily killed by rightist state- and paramilitary forces in a campaign of “island pacification” synonymous with mass death. It was a traumatic episode that had been lost for a time to oblivion, as all accounts and evidence of the massacre were heavily censored for a generation under South Korea’s past authoritarian governments. But eventually through the work of survivors, activists, and other advocates determined to ensure that the tragedy of the April 3rd massacres would not be forgotten, public opinion in South Korea and beyond had transformed to the point that sasam has come to be publicly memorialized in official and unofficial ceremonies every year. Moreover, by the “post-Cold War” period of the 1990s, it became widely recognized that Jeju Island had to remain demilitarized for the sake of regional peace and stability. This is because of Jeju’s sensitive location at the crossroads of Northeast Asia, particularly given its past use as a military outpost by the Imperial Japanese Navy during WWII. Part of the island’s tragic history is that, toward the end of Japan’s occupation of Korea (1910–1945), Japanese colonial forces built airfields on Jeju so that bombers could refuel in order to carry out aerial attacks against cities on China’s eastern seaboard including Nanjing and Shanghai. Peace in the region therefore hinges upon a peaceful Jeju, and among those who visited the island to attend peace conferences and high-level summits in the 1990s were Mikhail Gorbachev (1991), Jiang Zemin (1995), and Bill Clinton (1996). It was during that period when Moon Chung-in — a Jeju native and currently special advisor to the South Korean President — also proposed that the island be made “a hub of peace” along the model of Geneva. Jeju’s identity, which had revolved at the time around tangerine farming and a burgeoning tourism industry, would be burnished by Jeju’s official governmental recognition as an “Island of World Peace” in 2005. But the delicate balance of regional stability that had relied upon Jeju’s demilitarization would be dangerously altered by the realization of plans for the Jeju Naval Base, which has been vigorously opposed by peace activists for the past 11 years throughout the period of its construction until its opening last year. 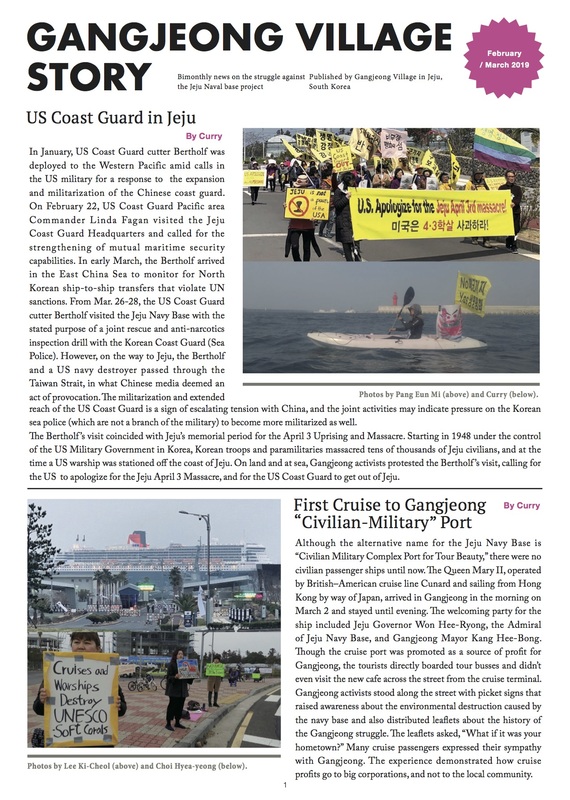 Given that military alliance agreements mean that US warships and nuclear submarines can readily port at Jeju, Gangjeong peace activists persist in their protests out of moral conviction and a collective refusal to back down in their opposition to conditions that they argue raise the risks of a future disastrous war. Morning after morning in Gangjeong Village, a dynamic group of peace activists have held a daily protest of creative dissent, to call out those enabling a dangerous elevation of military tensions. 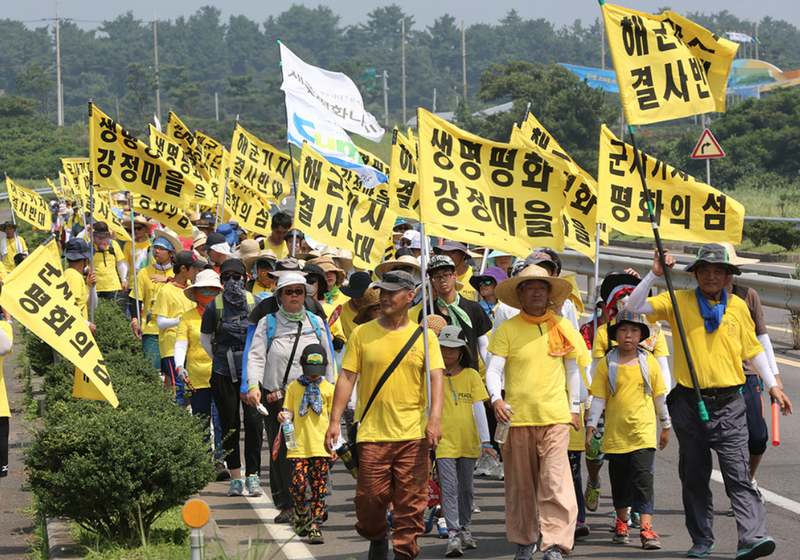 Year after year, hundreds converge on Jeju Island to take part in a march to participate in Gangjeong’s “Peace for Life Movement” (saengmyŏng pyŏnghwa undong). That includes visitors like me, who have spent time in the village and have been deeply moved by the dedication of the activists there, while marveling at the rhythms of its remarkable community. That is, sustaining a protest movement over several very challenging years has only been possible through resilience, courage, and a deeply artistic sensibility. Such creativity explains how they have continually repurposed discouraging circumstances into new material for direct actions, moving forward to sustain their dissent of ethical witness for yet another day. But when I visited this past summer, I was surprised and alarmed by how those rhythms had been disrupted. As an outsider, I could only begin to understand how wrenching had been the process of having this imminent Fleet Review imposed upon the village. It has divided the village community anew, opening deep wounds that recalled the original divisive battles over a decade ago surrounding the base construction. When I first visited Gangjeong Village in 2014, it appeared to me as a wholly civilian agricultural village. Over the years, I have witnessed the steady encroachment of the base’s presence, along with the appearance of more and more navy personnel, whose expanding appropriation of space has amounted to a militarized form of settler colonialism. One could understand how the phenomenon would be profoundly galling and distressing for the vast majority of the village residents, who had originally voted against the base construction, only to have their opinions ignored. But for survivors of the April 3rd massacres and their family members, the appearance of military vehicles and uniforms have been re-traumatizing — not to mention the imminent arrival of a procession of warships. This was not supposed to happen. These Jeju residents are the ones who survived a traumatic violent past and lived through decades to reach a more humane equilibrium. How can all of that have come to pass, now only for these survivors to see this dismaying, incomprehensible regression to militarism? That militarism has effectively displaced many Gangjeong residents from their own community while generating risks to countless others, a situation that goes against the spirit of the recent North-South Korean agreements in the name of building peace. Meanwhile, resistance to the base is a cause that has been marginalized by other Jeju residents, those persuaded into supporting the base construction by government lobbying and the lure of economic stimulus. In a further challenge for the Gangjeong activists, an extremely frustrating aspect of this controversy is the difficulty they have faced in rallying those who are in fact their long-time allies and advocates. That’s partly because the very name “International Fleet Review” sounds so bland and apparently benign. Alternative descriptive phrases could be “parade of warships” or “military festival,” but neither serves to convey the urgency and seriousness of what the Fleet Review represents. When the whole world seems plunged into crisis, this controversy over the Fleet Review is an issue that risks falling off of the radar of otherwise-enthusiastic supporters. Yet, the peace activists at Gangjeong are now putting all their strength and leveraging their formidable tradition of moral protest to oppose the Fleet Review, and they need more help — particularly from friends and advocates abroad — to support their cause. 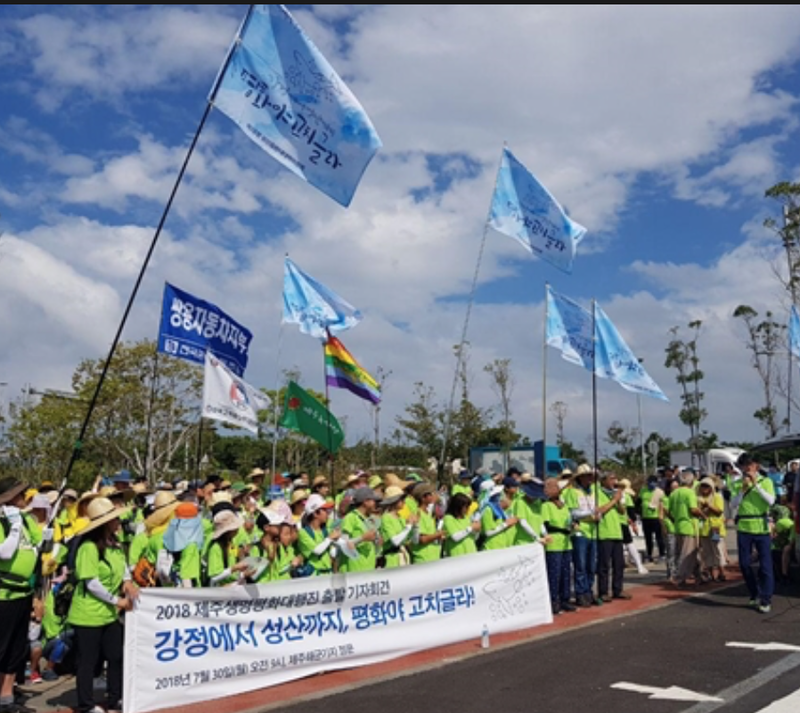 According to the Gangjeong activists, they are protesting the Fleet Review to oppose the ceremonial event that formally marks the relapse of Jeju into an international military outpost. The peace activists on the island therefore seek to warn against the ruinous dangers that such re-militarization would augur, if we only pay attention. Lately, here in the U.S., we find ourselves living through a time to remember Cassandra, the Trojan figure in Greek mythology who would utter prophecies that were true but not believed. I can begin to imagine how she must have felt, amid a host of feelings that could have taken hold at the worst points of any given day. But whether it be anger, or disbelief, or horror, or dread, such emotions need not be in vain. That is, not if we can stand up for each other and offer our support to those who have summoned the courage to face down a gauntlet of doubt or indifference and to speak the truth.